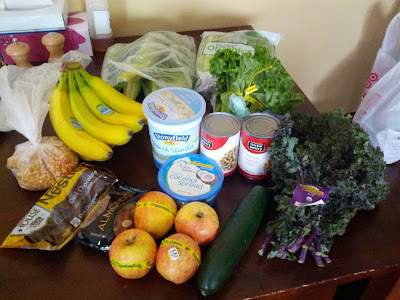 Fru-Gal.org: This Week's Grocery Trip and Menu Plan for $28.65, plus God Provides Fresh Produce and Meat! This Week's Grocery Trip and Menu Plan for $28.65, plus God Provides Fresh Produce and Meat! Getting ready to cook up some zucchini that was given to us! 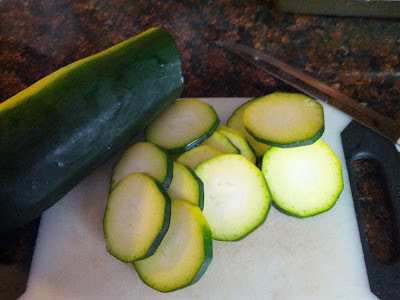 My one year old loves zucchini! My grocery trip this week, totaling $28.65. We have had some wonderful provisions lately from friends and family that has really helped our grocery budget! Several farming friends and gardening neighbors have given us extra produce over the past couple weeks (such a delicious blessing), plus we came home from our week away to a freezer stocked full of MEAT as well as some other goodies from Jesse's parents, and, while we were in the mountains, my parents bought us a whole bunch of groceries. God certainly provides. Chocolate chips... see that bag in the picture... yep, that's for me. Maybe it will last longer than one week (my sweet tooth can't go too long without chocolate, and gluten-free makes it a little harder to find acceptable treats)!